Friedrich Wilhelm Ostwald was born on September 2, 1853 in Riga, Latvia. His father, Gottfried, was a master cooper and he was the middle of three brothers. His family was German in origin, but he attended a local kronsschule with Latvian and Russian children and he attended the local real gymnasium school. He matriculated to the University of Tartu in 1872 and after briefly enjoying fraternity life the influence of his father convinced him to take his academics seriously. He started working in the laboratory of Karl Schmidt. From Schmidt's assistant Johan Lemburg he learned the essentials of inorganic analysis and he earned his bachelor's degree in 1875 and his doctorate in 1978 working in Schmidt's lab. In 1887 he served as an unpaid lecturer at the University of Tartu. Four years later he became a professor of chemistry at Riga Polytechnic University and six years after that be became professor of physical chemistry at Lepzig University. Ostwald remained at Lepzig until his retirement in 1906, except for one year as the first exchange professor at Harvard University in 1904-5. Ostward's lab became a center for instruction in physical chemistry and among his students were many Nobel Prize winners including Arrhenius, Van 't Hoff and Nernst. Albert Einstein applied to work in Ostwald's lab. Ostwald began his research in 1875 studying the law of mass action of water with the problem of chemical affinity and with special emphasis on electrochemistry. This led to the discovery of the law of dilution, which is named after him and governs the disassociation of a weak acid or base. Ostwald became one of the founders of modern physical chemistry and wrote several textbooks on the subject. Ostwald founded Zeitschrift fur physikalsche Chemie in 1887 and remained its editor until 1922 editing over 100 volumes. He is the inventor of the Ostwald process for producing nitric acid, which he patented in 1902. His development of the mole concept (a mole of a chemical being equal to its atomic mass in grams) was ironically part of his resistance to atomic theory, against which he was one of the last holdouts. 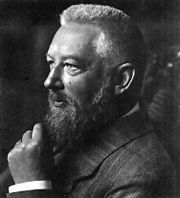 Ostwald won the 1909 Nobel Prize "in recognition for his investigations into the fundamental principals governing chemical equilibria and rates of reaction". Besides chemistry Ostwald had many insterests including philosophy and painting, for which he produced his own pigments. Later in his career he wrote several books dealing with color theory. Ostwald died on April 4, 1932.